The Neglected Genocide. Genocide and political fraud in West Papua, Melanesia. The Indonesian government has killed around 500,000 West Papuans since 1961. West Papua has a legal right to self determination and independence. Please read and share this report from the Asian Human rights commission on just a small part of the genocide committed against the West Papuan people by the Indonesian government. 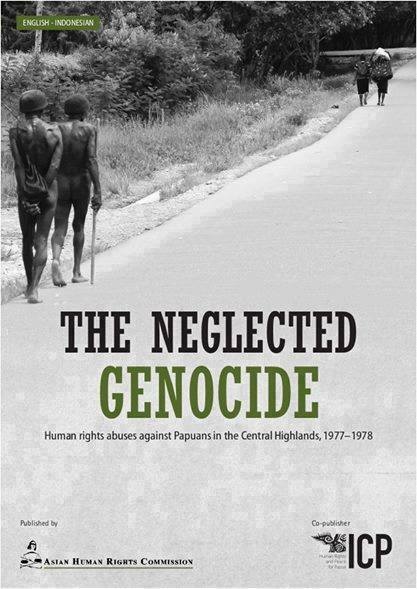 This report is about the massacres in the Baliem valley 1977-78, when at least 10,000 West Papuans were murdered. The report collected many of the names. The details of Indonesia’s actions can be found in the report. They include crucifixion, boiling people alive and opening pregnant women with bayonets. No one has ever investigated any of the mass killings and massacres in Teminabuan 1965, Arfak 1967, Paniai, 1967-69. Ayamaru 1966, Jayapura 1971, Biak-numfor 1974/5 All over West Papua 1969, Baliem valley 1981-84. Timika 1982, Border area with PNG 1985, Merouke 1986/87/88, Timika 1996 and 2000. Biak 1998. Wasior 2000, Wamena 2000, 2004, 2006 Jayapura 2006 2008, 2010, Jayawijaya 2013, Panaii 2014, Yahukimo 2015 amongst many others.